Paint is one of the most abundant and most versatile tools anyone can have in their redecorating toolbox. It can make a dark dingy room suddenly seem light and airy or transform a cramped area into one that appears spacious and bright. While walls, of course, are your biggest canvas they don’t need to be your only or even your main focus. You can alter the whole style and feel of a room without committing to repainting it. It’s natural to consider the walls for a dramatic change in your décor but altering your furniture with pain can achieve similar impact. If you rent and you’re not allowed to touch the walls this is a simple solution to brighten up your room without endangering your lease. If the walls are white or any whitish shade you might want to try for a bold color. Also, painting your furniture can offset the monotony of a room if the furniture was purchased in a set or it matches the color of the walls or floor. Get funky with patterns and multiple colors or take the classic route and layer on a coat or two of varnish. Sanding and priming the piece before painting will help you achieve beautiful results, and don’t forget a final protectant coat which can be glossy or matte which will also change up the feel of a room. 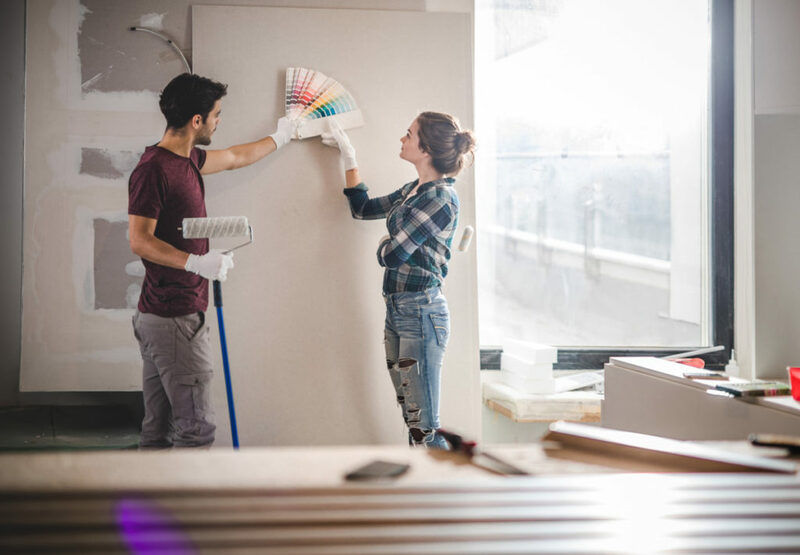 If you own your home or are able to paint the walls of your rental, selecting a paint color can give the impression of more space, light, or a comfortable feel. Neutrals like pale gray, white, and beige are always a good choice—they’ll make the room seem brighter or even larger. Painting a ceiling white creates visual openness above and draws the eye upward. If you want to emphasize a small space, go bold with dark colors. You can create a cozy den-like atmosphere with colors like black, dark gray, and navy. If you don’t want to alter the entire room, choose an accent wall. This will allow you to introduce a pop of color without going all out, while a soft neutral hue can help transform your space into a serene escape. Renewing a floor, especially if you choose DIY can be a long and frequently expensive undertaking. A little floor refreshing doesn’t have to be a replacement of surface, you can choose something simple like a durable coat of paint. Go for a solid color—or take a tiled pattern approach. You will need to do a bit of prep beforehand, like rubbing off the finish with a sanding sponge and giving the floor a good cleaning with a damp cloth. Put on a layer of primer, then get to layering on the paint, cutting the edges with a brush first. Work in thin coats with a roller and allow each to dry thoroughly for best results. Your stairwell is an often overlooked, high-traffic space. Paint a runner instead of carpeting. Or do something more custom like a brick or even book pattern. Like floors, you’ll want to sand and prime your stairs first before adding a base coat. Once they’re dry, add a few coats of protectant seal since this area will get lots of wear. Painting your cabinets is a simple and inexpensive alternative that will instantly give your kitchen looks and feel. Remember, some surfaces will be easier to paint than others: unfinished wood, wood laminate, and metal are easy to work with, while plastic laminate might require the help of a professional. Remove the doors before painting and don’t forget to sand, clean, prime, and seal. And—adding new hardware after painting can make a huge difference. Take some time and choose the right colors and textures for your project and space. Whether you decide to paint a whole room, one wall, or the furniture, it’s best not to paint impulsively. Be comfortable in your choices then get right to taping off the area of your painting endeavor. Paint is probably the least expensive way you can transform the look and feel of your home.